The last royal descendant of Kamehameha I, Pauahi honored her ancestors when she bestowed the name Kamehameha on the schools she endowed in her will. Considered during Pauahi’s time as “the most conspicuous name in Polynesian history, a name with which we associate ability, courage, patriotism and generosity,” five monarchs ruled the Hawaiian kingdom under the Kamehameha name. Three of them reigned in her lifetime. Kamehameha I (sometimes called the Great) founded this dynasty by uniting the eight major islands of the Hawaiian Chain under his rule in 1810. 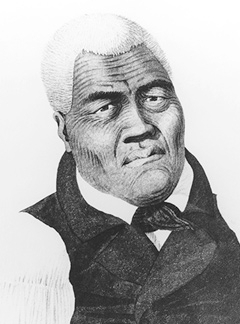 The son of Chief Keouakupuapaikalaninui and Chiefess Keku‘iapoiwa, Kamehameha is believed to have been born in about 1758. Raised in the courts of Alapa‘inui, and later, Kalani‘opu‘u, the ali‘i nui (ruling chiefs) of the island of Hawai‘i, Kamehameha became a skilled and fierce warrior and intelligent leader. As a young man, Kamehameha met Captain James Cook in 1778 on Cook’s second visit to Hawai‘i. It was his first of many encounters with foreigners from the outside world that would influence his vision and strategies in the future. Before dying in 1782, Kalani‘opu‘u declared his son, Kiwala‘o, heir to his rule and Kamehameha the guardian of the family’s war god, Kuaka‘ilimoku. Several Kona district chiefs, unhappy with Kiwala‘o’s new division of lands, enlisted Kamehameha as their leader. Over the next thirteen years, Kamehameha and his loyal followers would battle for control not only for the island of Hawai‘i, but for the other seven as well. By 1795, he conquered five islands. Only Kaua‘i and Ni‘ihau eluded his grasp. Thwarted by rough seas and strong winds on one occasion and an epidemic on another, it was 1810 before Kamehameha and Kaumuali‘i, the king of Kaua‘i, peacefully negotiated to place Kaua‘i and Ni‘ihau under Kamehameha’s control. Kamehameha I died in 1819 and was buried secretly by trusted companions as befits a high chief, and was greatly mourned by his people.